Surging issuance protects insurers while investors reap profits. (Bloomberg Opinion) -- Leave it to catastrophe bonds to be among the most well-functioning debt markets out there. 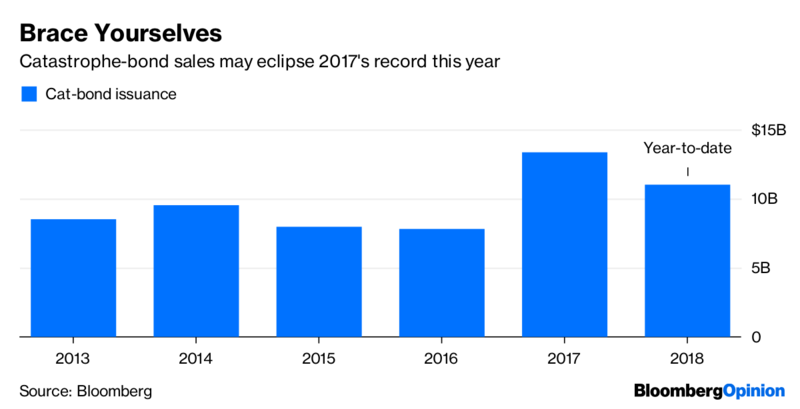 Issuance of “cat bonds” has climbed to more than $11 billion this year, about the same as this time in 2017, when sales hit a record, according to data compiled by Bloomberg. The debt helps protect insurers from potentially massive costs tied to damage from hurricanes, floods or other natural disasters. That’s important given that Hurricane Florence has strengthened into a Category 4 storm barreling toward the U.S. East Coast, with top winds reaching 130 miles (209 kilometers) an hour. But that’s not what’s happening in this sliver of the financial markets. In fact, the bonds have gained 4.3 percent this year as measured by the Swiss Re Cat Bond Total Return Index. They’re up a remarkable 20 percent from 12 months ago, bouncing back from the index’s steepest loss on record in the wake of a devastating month for Atlantic hurricanes. 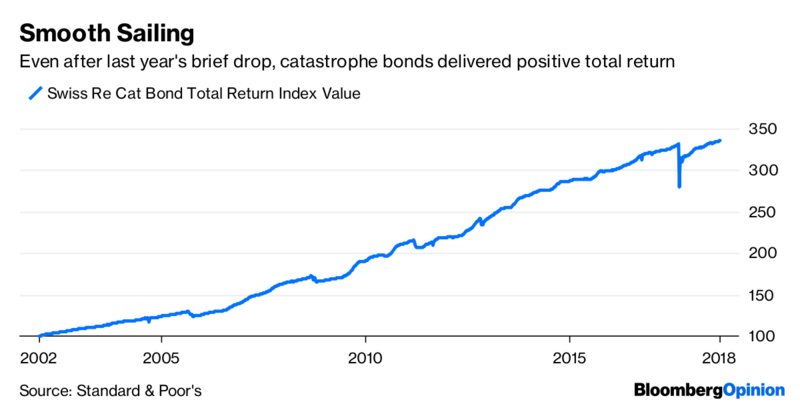 In fact, as Bloomberg News’s Michael Regan pointed out, cat bonds haven’t posted a negative annual return since the index began in 2003. So issuers are well protected and investors are well compensated. What’s the catch? Certainly, a huge storm that activates so-called trigger events on a wide swath of securities would devastate investors. And their buffer is shrinking as the market matures — the average coupon on a cat bond issued this year is a mere 5 percent, Bloomberg data show. The average expected loss, according to a report from Brendan Grady at KeyBanc Capital Markets, is 2.71 percent. Combined, the spread is the narrowest ever. This specificity works to the advantage of all parties. For bond buyers, it reduces the likelihood that their money will be diverted away to cover claims. For insurers, it’s not as if cat bonds are the only method of insulating themselves from losses. Rather, the debt is just another way to hedge against a once-in-a-generation type of disaster. The other upside for buyers is that these bonds have little to do with the overall economy and business cycle. That makes them a strong candidate for diversification among the typical “sophisticated investor” crowd — pensions, endowments, family offices and hedge funds. According to Kroll, 2017 generated the most disaster damage in the history of the insurance-linked securities market. And yet it’s as strong as ever. Ironically, Kroll says the decline in credit ratings on these transactions — down to 27 percent of volume since 2013 from 75 percent previously — signals that investors are comfortable with the risks embedded in cat bonds. They simply don’t need to rely on the agencies’ input anymore after they have seen how this debt performs in bad times. For the superstitious, this is the time to knock on wood. Insurers and investors alike would prefer no disasters at all, particularly one like Florence that could be in the same mold as Hugo, which killed 49 people in the U.S. and across the Caribbean. Total return seems inconsequential when people’s homes are destroyed. But the cat-bond market is specifically designed for if and when disaster strikes. And at least for now, it seems built to last.